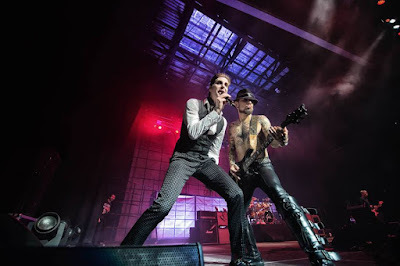 Jane’s Addiction are sharing a video preview of their forthcoming live release, “Ritual De Lo Habitual - Alive At Twenty-Five." Due August 4, the project captures the Los Angeles band performing their breakthrough 1990 album in its entirety alongside their biggest hits on the 2016 Silver Spoon Anniversary Tour at the now-demolished Irvine Meadows Amphitheatre in Irvine, CA – the birthplace of Lollapolooza twenty-five years earlier. The follow-up to their 1988 studio debut, “Nothing’s Shocking”, “Ritual de lo Habitual” saw Jane’s Addiction embrace their psychedelic and progressive sides with tracks like “Three Days” and “Then She Did…” while singles like “Stop!” and “Been Caught Stealing” helped propel to the album to triple-platinum status in the US. "25 years - what a beautiful milestone for both Ritual De Lo Habitual and Lollapalooza,” says event cofounder and vocalist Perry Farrell. “As both were great achievements in our lives that also helped change the course of music history, we really sought to come up with a special show for this tour so that the fans could celebrate it with us." Directed by Mark Ritchie (Kanye West, Madonna) and filmed in 4K resolution using twenty cameras, “Ritual De Lo Habitual - Alive At Twenty-Five" will be available on Blu-ray, DVD, CD and vinyl. Jane’s Addiction picked up their first nomination for the Rock And Roll Hall Of Fame in 2017, but failed to secure enough music industry support to earn inductee status.